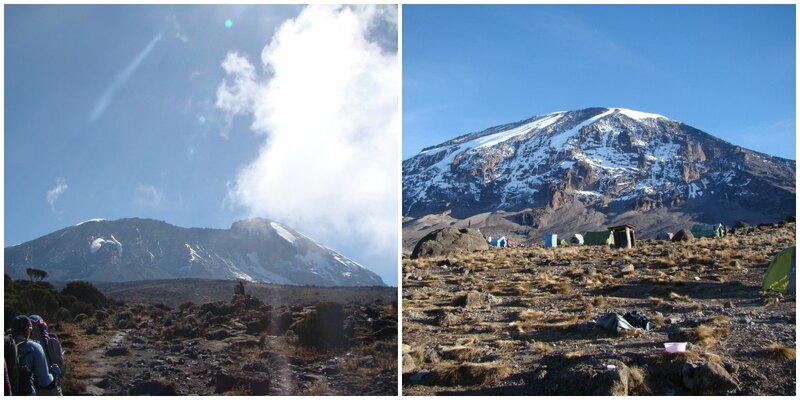 When I started to prepare for my adventure to climb Mount Kilimanjaro, I was overwhelmed with thoughts and fears of what would happen if I didn’t have the right gear. It’s not like you can go to a store if you forgot something once you’re on the mountain or even in Tanzania for that matter. I spent a lot of time preparing myself and making sure I had ALL of the right gear, making sure I had every possible situation covered. So if you are asking yourself, “How do you even pack for a trip like this?” I’m here to help. I wish I had this list (with photos, too!) when I was packing so I hope this answers your questions and helps make packing easier. The Porters are limited to carrying a maximum of 15 kg (35 lbs) of luggage for you. They are life savers and I really don’t know how they do it. Be sure to thank them and show your gratitude. Pack light but for all seasons/conditions. You go through 5 temperate climates in just a few days. Be prepared for that. LAYERS LAYERS LAYERS – Lots of layers and things you can re-wear. NO COTTON – it is said that it doesn’t dry at high altitude and you don’t want to chafe. Stick with breathable and moisture wicking fabrics. Pack one complete hiking outfit on the plane, including a long sleeve shirt, hiking pants, underwear, socks, and hiking boots. You can rent nearly everything but you don’t want to risk blisters ruining your whole climb. Be selective in what you take with you. The less you have to carry the easier your hike it and the porters are limited to what they can carry for you. Be prepared to not shower for a week, to take wet wipe baths and to squat behind rocks. Don’t worry. All the cool kids are doing it. It gets cold on the first night. Be prepared to wear the same thing day in and out. The air is thin and cold so you don’t (or probably won’t) sweat or stink like you normally would after a week without a shower. Get a camera that is small and fits in your hip pockets of the backpack. You want easy access and don’t want to carry it or have to take off the daypack to take pictures. The easiest way to keep going is to not look too far ahead. Do take in scenery but focus on one step at a time. It can be mentally exhausting to see the camp site ahead but know it is still 4 hours away. Be like the elephants and watch the feet of the person in front of you. Before you know it, you’ll reach your destination. Pay for the package that has hot meals included instead of box lunches. Trust me. Get a toilet tent. It is worth every penny – especially if you are a woman. Again, trust me. Save your iPod battery for summit night. Music makes it SO much easier. Do you wear contacts? I was worried about this but had no problem with the clean water they provided. Ladies- I found putting my hair in pig-tail braids helped keep it cleaner and easier to maintain for 7 days sans shower. Before you leave home make sure you can layer and wear all your clothes on top of each other: Don’t buy all small sizes and then get to the mountain and realize you can’t layer them. Big Uh Oh. 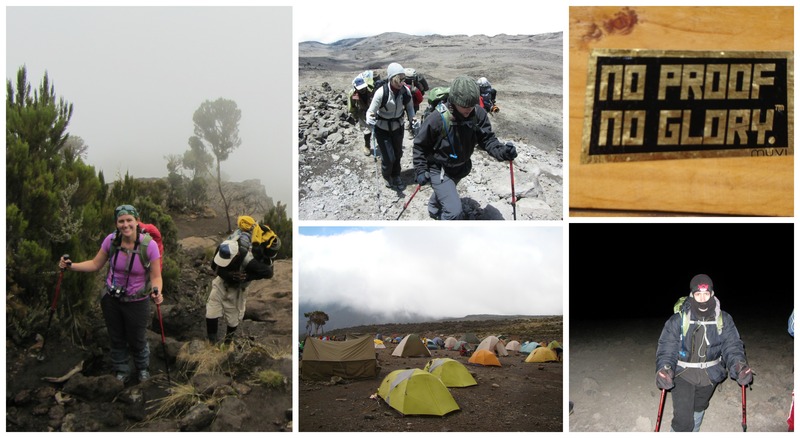 One of the reasons that I selected Climbing Kilimanjaro as my guide company is because I was able to rent gear through them. Instead of forking over tons of money for new gear, most of which I would likely not use again or often enough to justify the cost, I opted to rent some stuff. Most guide groups offer you the option of renting gear for a small price. Added benefit – I didn’t have to pack and schlep as much (or the heavy bulky things) in my suitcases. I was worried about using someone else’s sleeping bag. I got over that real fast when it was warm. Medium sized daypack (25-30 Liters) *To carry only the things you need during the day like clothes, water, raincoat, warm clothing, camera and food. Daypack rain shield cover- to protect from soaking your belongings. My daypack came with one. Sleeping bag liner – brought but never used. Dry Sacks – or plastic bags to protect equipment from rain. I had a 4 L, 8L, 16L and 32 L Sea to Summit bags to stay organized. Platypus Water Bag – Perfect and ideal so you don’t have to stop to drink. Water filtering iodine chemical tablets. NO COTTON. Wear fabric this is breathable, synthetic and moisture wicking. Sweatshirt just for sleeping – (optional) I wanted this the first few days but it wasn’t necessary. Waterproof hard shell jacket with hood – breathable and water-resistant. Medium gloves. Something warmer than glove liners but not as heavy as summit gloves for daily hiking. Sock liners- 2 pairs Thin, synthetic and one size smaller. They stretch and then cause blisters. Sun screen – didn’t use. Oops. Extra batteries for camera & headlamp (leave extra batteries in a pair of socks to keep warm. )Batteries don’t do well in the cold and high altitude. Also, check the camera specs before you go to be prepared. You don’t want to have a surprise when you get to the top as you probably won’t want to climb to the summit again just to get that snapshot. Wet wipes for hygiene and cleaning – more than you think you need. then add more. You don’t need expensive camping brand. $1.99 Wet Ones from Target will work. Anti-itch cream for bug bites. FYI the mosquitoes are enormous! iPod- but save your battery for summit night. Nalgene bottle to pee in – I cut myself off at 6pm so I didn’t have to go because at night the last thing you want to do is leave the warmness of your tent for the frigid air to pee. Go Girl – pee funnel to pee into bottle. No need to bring makeup. Advil – Heard this helps with AMS too. Took 2 every morning and never ached or got sick. First-aid kit that includes bandages, tape, blister kit, antibacterial cream, antibiotics for travelers’ diarrhea, antimalarials, antihistamines, cold and flu medications, throat lozenges, and altitude medications. Blister kit – with tape, Neosporin and Band-Aids (both regular and blister Band-Aids) I used this even as preventative measures. Diamox (Acetazolamide)-Used to prevent/combat altitude sickness. I took generic brand and had no symptoms of AMS. There were 4 of us that climbed together, 3 took meds 1 didn’t. The one girl was fine until summit night. She was the only one who got sick. Down fall to it – it is a diarrhetic so it makes you pee more. I cut myself off from drinking water at 6pm so I didn’t have to leave my tent in the bitter cold to pee and it worked like a charm. Lastly, the most important thing to bring with you is a positive mental attitude. As cheesy as that sounds, this really can be what makes it or breaks it for you to make it to the summit sign. After 5 days, I came to the top with an hour and a half left and wanted to give up but it was that belief that, “Yes I Can Do It!” that made it possible. You Can Do It! Good luck and have fun on your journey! If you have any questions on what to pack or what it is like, please feel free to shoot me an email. I’m excited for you to embark on this amazing life changing journey. Did you climb? What did you bring with you that you found helpful or necessary that I didn’t list here? Please leave a note in the comment section to pass on your wisdom to other potential climbers.